The last couple of years have seen a very active housing market, as homes sold faster and for more money. That's good if you were trying to sell your home, not so good if you were trying to buy. While it still appears to be a seller's market, real estate marketer RE/MAX reports the pace sales slowed considerably last month, usually the time that the spring housing market takes off. April home sales were down 4.1% from March and 4.5% from April 2016. But the rest of the report suggests the drop is not entirely due to a lack of demand. 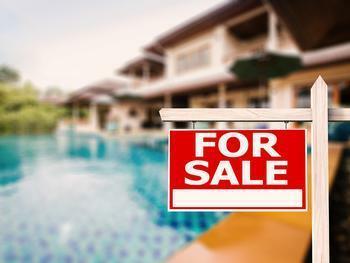 Consumers may still want to buy homes, they just might have a harder time finding one to buy. Home selling in April spent an average of only 57 days on the market. In the nine years RE/MAX has compiled this report, that's the lowest it's ever been in April. The median sale price rose to $226,000 last month. Again, that's another April record and the 13th consecutive month the median sale price has increased. The inventory of available homes in April was down more than 17% from April 2016. In March, the months supply of available homes dropped below three months for the first time ever. In April, there was only a 2.8 months supply of homes. Inventory below six months is considered a seller's market. A big majority of the 53 metro areas in the report saw sales declines in April, maybe because many of the buyers made purchases in March. March saw a a 6.6% spike in sales, perhaps because many buyers were motivated to act sooner because of the lack of inventory. "We may be seeing some frustration from buyers," said Dave Liniger, RE/MAX Chairman and CEO. "Inventory is tighter than ever, while strong demand keeps driving up home prices." But if the demand is there, why aren't more sellers taking advantage of it? Liniger says that tight inventory is proving to be a double-edge sword. While fewer homes for sale makes those that are on the market sell faster and for more money, the sellers then have to wonder where they will live. Once they sell and become buyers, they face the same tough market conditions that are affecting the market. Liniger says that might make homeowners think twice about selling their homes.